Anyone who's participated in any of the Winship Win the Fight 5K events knows that cancer survivors embody the spirit of the event. Some have run the race even when they needed a helping hand to cross the finish line, even when they weren't sure what the next stop would be in their cancer journey. Wally Curran envisioned the race as a way to celebrate the progress that has been made against cancer and to raise money to support the research that keeps the momentum going. From year one, the Winship 5K has carved its niche in Atlanta as an event that unifies patients, their families and friends, doctors, nurses, researchers, staff, and the community. "Winship was there for us and we want to be there for others." "The people out here today are not exercising. These people are out for a cause." We were ready to do it up big this year and make the 5th annual Winship Win the Fight 5K the best one yet. 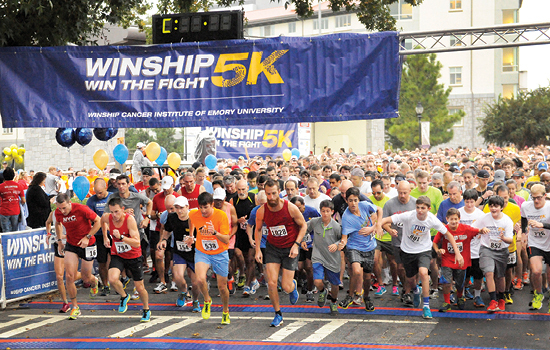 When weather scrubbed the outdoor festivities, something uniquely Winship took place instead: a 0.5K “race” inside Emory University Hospital, run by patients on the three oncology floors. They went the distance — 13 laps around the ward — while doctors, staff, and event sponsors cheered them on. "I'm grateful for the support that the 5K gives to critical cancer research that might not have other funding sources."